Register through the SCAC here! I am so happy to be visiting the Shelby County Arts Council in Columbiana, AL! Join us for an exploration of Indigo and Shibori. 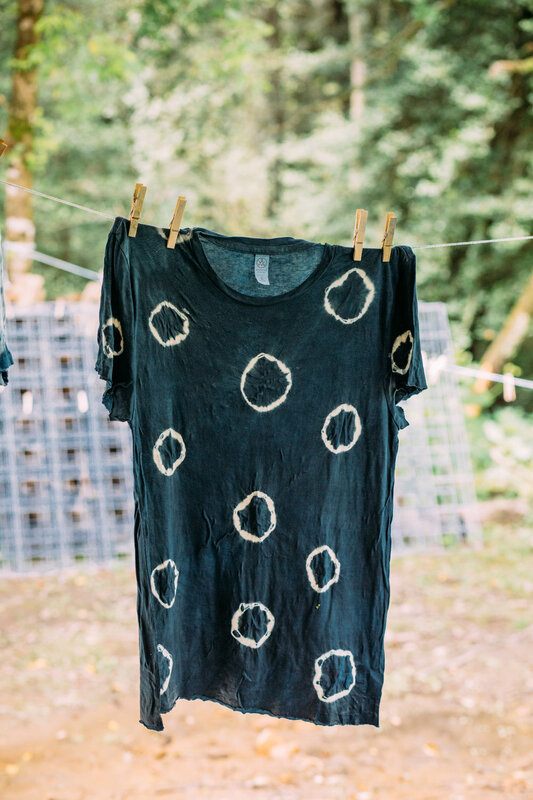 Participants will learn basics of dyeing with a natural indigo vat, along with various approaches to shibori dyeing. We will focus on Itajime (shape resist) and Kumo (twist resist) techniques, as well as more experimental techniques. Materials will be provided, and participants are highly encouraged to bring their own small, natural fiber items to dye if time allows. Students will leave with dyed cotton fabric, dyed goods from home, and a handout detailing the dye process. • Learn basics of Itajime (shape resist) and Kumo (twist resist) shibori dyeing, and other shibori techniques. • A yard of cotton will be provided for experimentation. • Students are highly encouraged to bring small goods to dye. Cellulose fibers (cotton, linen, rayon, ramie) accept the color the best. Vintage linens, pillow cases, dishtowels and clothing are all perfect for this. Pre-wash in hot water before the workshop. • Wear old clothing and shoes that can be stained. The dye will splash. Bring a pair of rubber dishwashing gloves.